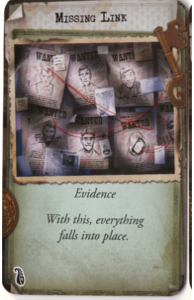 So i decided to make a complete inventory list for Mansion Of Madness, the idea came after my Girlfriend had lost a card from the game, and we searched the internet, googled alot, and did not find anything i could use, no full list of cards and what they do. so i decided to make one. The Mansion of Madness Core Game List. 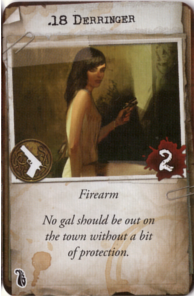 This was the list of cards you will also get the following in the Mansion of Madness 2nd Edition Core set. 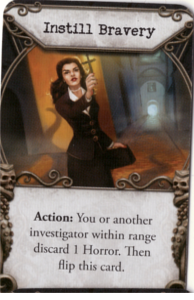 These are the Investigators in Mansion of Madness which you get in the core game set from fantasyflight games. 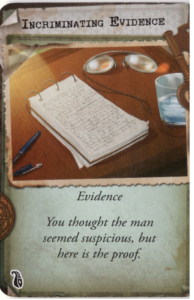 these investigators each got a story which you will find on the backside of the card, and you will ofc need to purchase the game at your local store to play it. ACTION: Another investigator within range may perform 1 action. 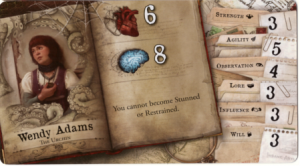 Activate this ability only once per round. ACTION: Another investigator within range becomes Focused. 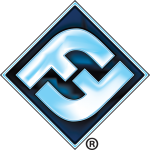 Activate this ability only once per round. 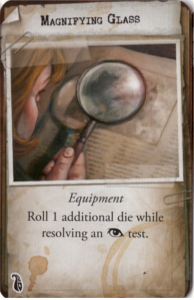 Once per round, you or another investigator within range may reroll 1 die while resolving a test. Once per round, when you gain an item, you may flip 1 Horror facedown or discard 1 facedown Horror. You may move 1 additional space as part of a move action. 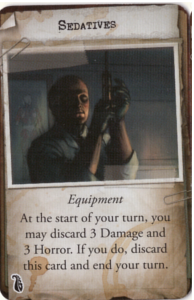 This is a firearm weapon doing 2 damage. Shoot at the monster to bring them down. 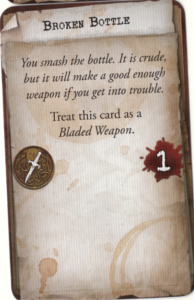 This is a firearm weapon Doing 3 Damage. Shoot at the monsters to bring them down. 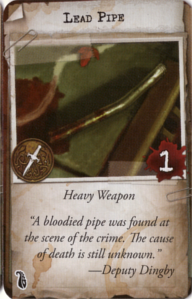 This is a firearm weapon doing 4 Damage. 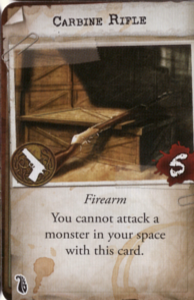 Shoot at the monsters to bring them down. 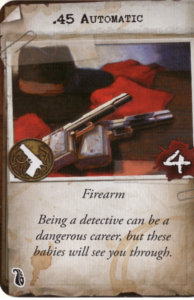 Being a detective can be a dangerous career, but these babies will see you through. 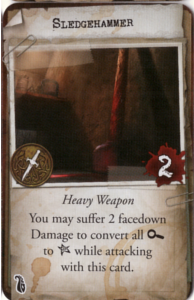 The 2 X 4 is a Heavy weapon doing 2 damage, a big plank you can hit the monsters with, the following text is on the card. ACTION: You brace the door with the board. 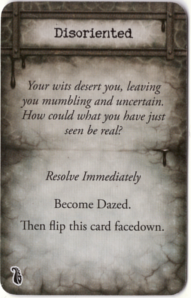 Flip this card and place it against a door to your space. 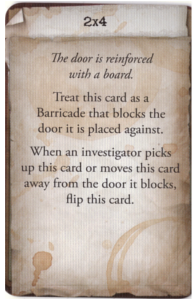 Treat this Card as a barricade that blocks the door it is placed against. 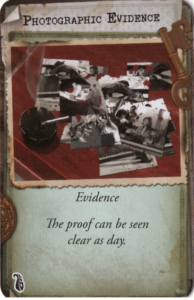 When an investigator picks up this card or moves this card away from the door it blocks, flip this card. 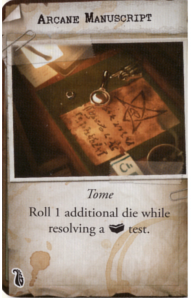 Roll 1 additional die while resolving a lore (the little book) test. 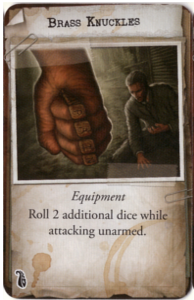 Roll 2 additional dice while attacking unarmed. Use this to light up your way around in the dark. 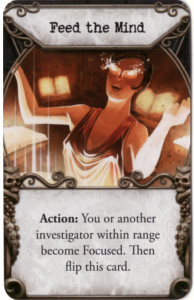 ACTION: Another investigator within range becomes dazed. Candles can light your way. 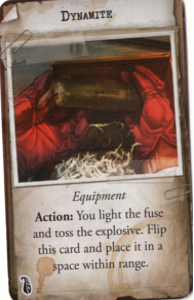 ACTION: You light the fuse and toss the explosive, Flip this card and place it in a space within range. 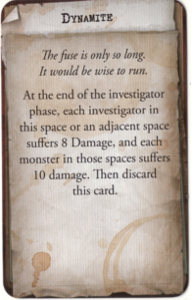 At the end of the investigator phase, each investigator in this space or and adjacent space suffers 8 damage, and each monster in those spaces suffers 10 damage. 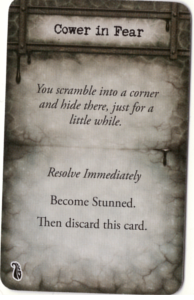 Then discard this card. 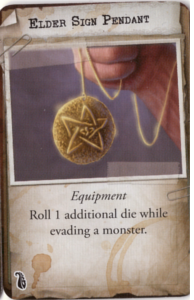 This a necklace with a elder sign in it. This is a warding sign. 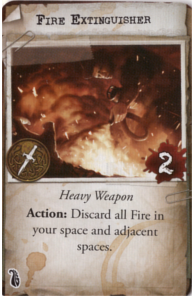 This is a way to put out fire that is started in the game. and to smack the monsters in the head with a fire exstinguisher. 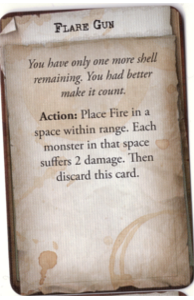 ACTION: Discard all Fire in your space and adjacent spaces. This is a flare gun. to set fire on things. You have only one more shell remaining. You had better make it count. 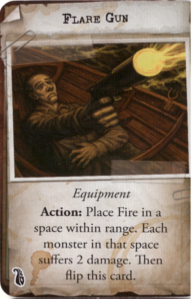 ACTION: Place Fire in a space within range. 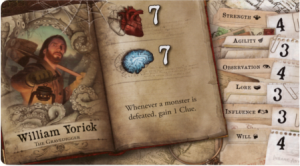 Each monster in that space suffers 2 damage. 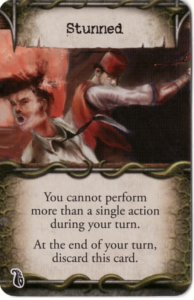 Then discard this card. This is a standard very pretty Holy Cross. 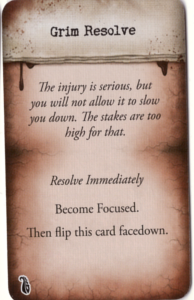 ACTION: Discard 1 horror and become focused. 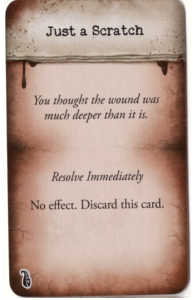 Then discard this card. 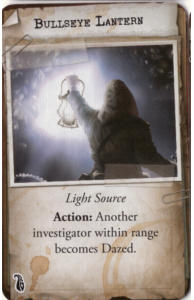 You may discard this card to convert focuses (magnifying glasses) to successes (stars) while attacking unarmed. 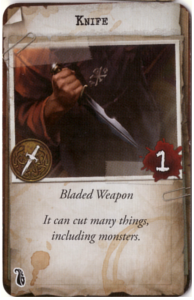 It can cut many things, including monsters. 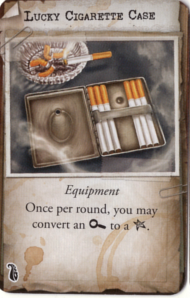 Once per round, you may convert an Focus (the magnifying glass) to a success (Star). 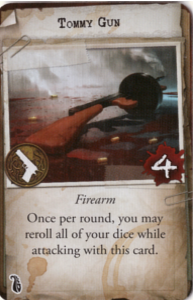 Once per round you may reroll 1 die. 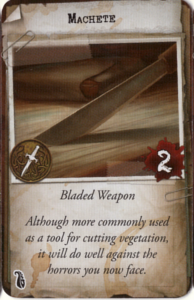 Although more commonly used as a tool for cutting vegetation, it will do well against the horrors you now face. Roll 1 additional die while resolving an Observation (Eye) test. Ever been to a butchers shop ? 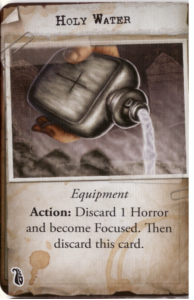 You may suffer 2 facedown Horror to convert all focuses (magnifying Glass) to successes (Star) while attacking with this card. 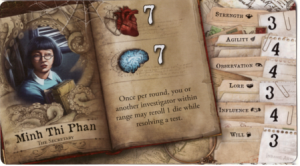 Ever wanted to learn about medical stuff ? 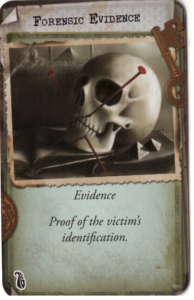 ACTION: You or another investigator within range may discard 1 facedown damage. 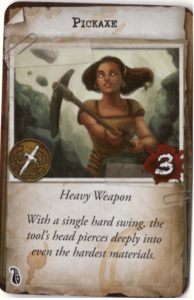 With a single hard swing, the tool’s head pierces deeply into even the hardest materials. 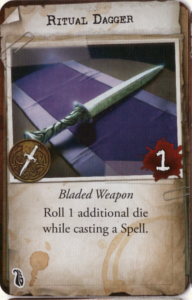 A nifty dagger for rituals want to try it? 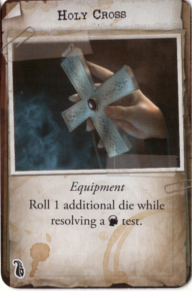 Roll 1 additional die while casting a spell. Drugs are dangerous but to be sedates is sooo relaxing. 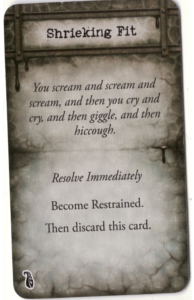 At the start of your turn, you may discard 3 Damage card and 3 Horror. 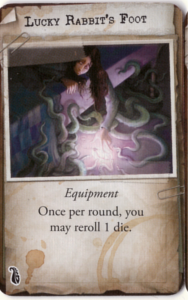 If you do, discard this cad and end your turn. 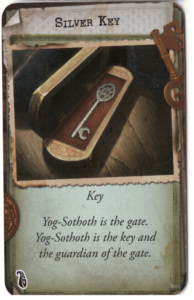 You cannot attack a monster that is more than 1 space away with this card. 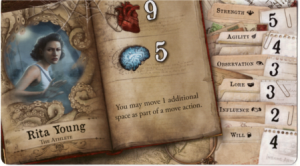 You may suffer two facedown damage to convert all Focuses (Magnifying glasses) to stars (Successes) while attacking with this card. 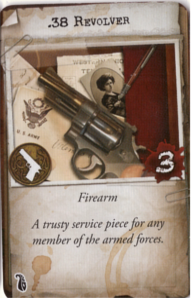 Is this Tommy’s Gun ? 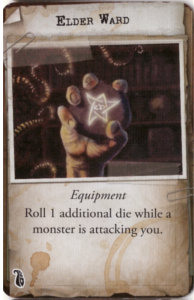 Once per round, you may reroll all of your dice while attacking with this card. 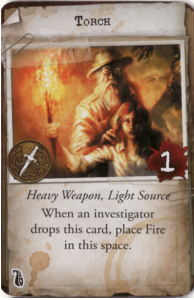 When an investigator drops this card, place a Fire in this space. Drink it to relase yourself from the Horror. 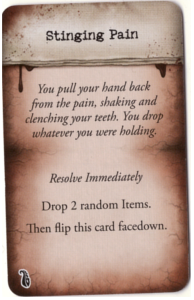 ACTION: Discard up to 2 facedown Horror. 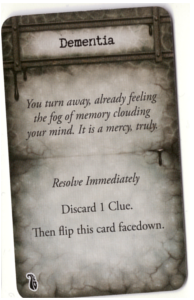 Then flip this card. You smash the bottle. 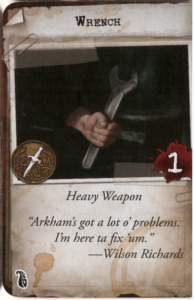 It is crude, but it will make a good enough weapon if you get into trouble. 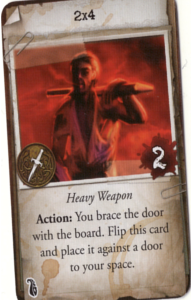 Treat this card as a Bladed Weapon. A tool for cars ? A plain Brass key, yes it is nothing special ! Uuh Look what i have found over here. 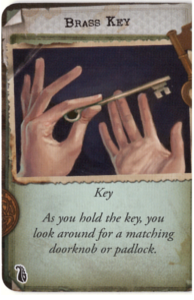 This key might be evidence. 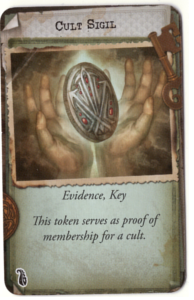 This token serves as proof of membership for a cult. Woof Woof i can get that item for Ya. At the start of your turn, you may perform a trade action as if you are in any space within range. 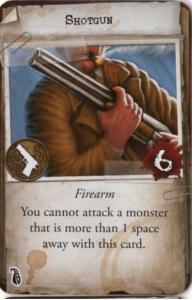 At the start of your turn, move a monster within range up to 1 space. 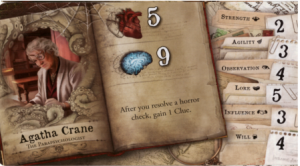 Did you get that autopsy report before we entered ? 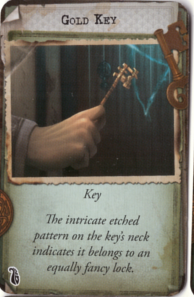 The intricate etched pattern on the key’s neck indicates it belongs to an equally fancy lock. ACTION: You attempt to handcuff the suspect (Agility(wings); 2 ). 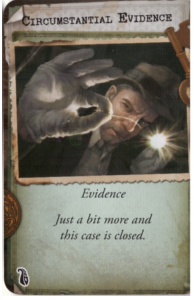 If you pass, flip this card and give it to another investigator in your space. The flip side of the handcuffs. 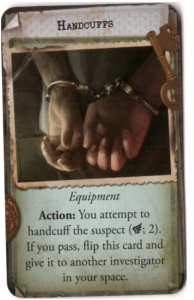 You struggle against the handcuffs to no effect. You will have to pick the lock. 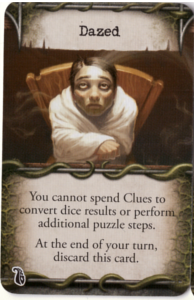 You cannot spend clues to convert dice results or perform additional puzzle steps. 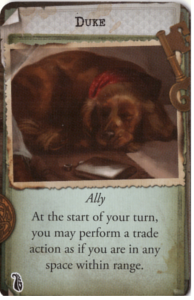 This card cannot be traded. 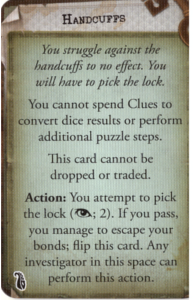 ACTION: You attempt to pick the lock(observation(Eye); 2). 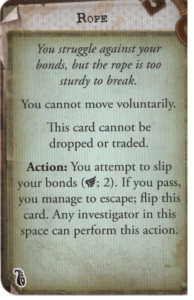 If you pass, you manage to escape your bonds; flip this card. Any investigator in this space can perform this action. 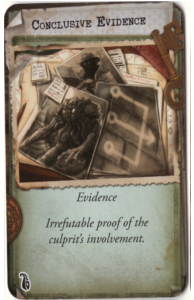 We are close with this evidence. You thought the man seemed suspiciou, but here is the proof. Something is missing here ? With this, everything falls into place. If i rub it do i get a genie and three wishes ? 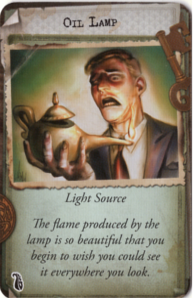 The flame produced by the lamp is so beautiful that you begin to wish you could see it everywhere you look. 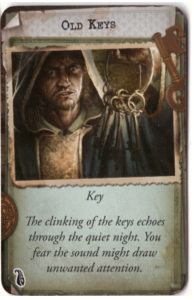 The clinking of the keys echoes through the quiet night, You fear the sound might draw unwanted attention. 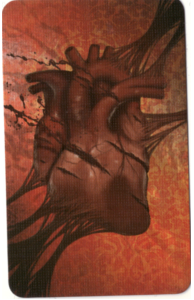 this is some old booklet. 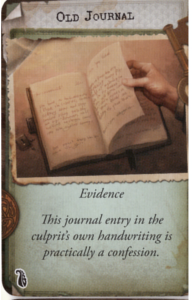 This journal entry in the culprit’s own handwriting is practically a confession. The proof can be seen clear as day. The intricate patterns seem to shift and change as you move the panels. You cannot imagine what prize awaits you. Someone performed a ritual here. 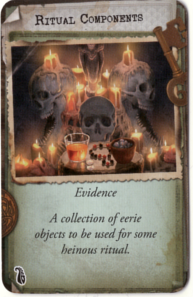 A collection of eerie objects to be used for some heinous ritual. Should we tie someone up? ACTION: You attempt to restrain the suspect (strength; 2). 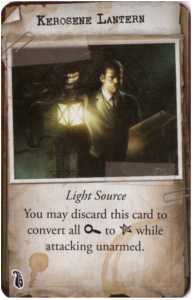 If you pass, flip this card and give it to another investigator in your space. 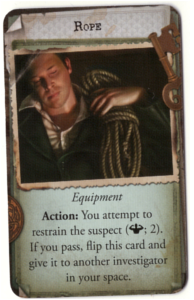 This is the flipside of a Rope card. You struggle against your bonds, but the rope is too sturdy to break. 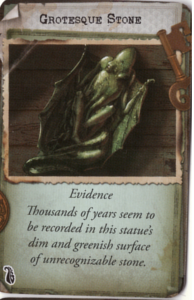 This card cannot be dropped or traded. ACTION: You attempt to slip your bonds (agility; 2). 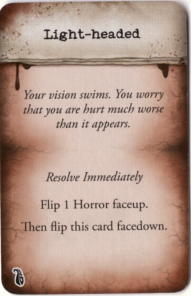 If you pass, you manage to escape; flip sthis card. Any investigator in this space can perform this action. the guardian of the gate. 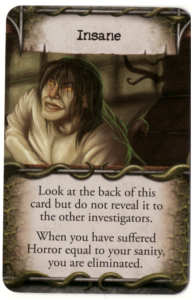 These Are cards that is given to an investigator when under the influence of a certain condition, there is 37 cards total in the Mansion of Madness 2nd edition Core set of the game and they will have this card back a greenish back with some art . 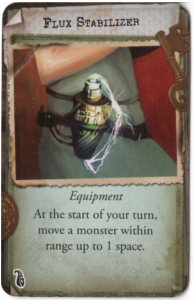 There are 5 Dazed card in the core set. 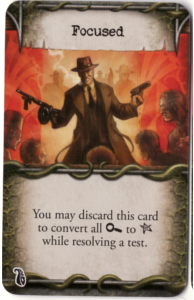 You may discard this card to convert all Clues to Successes while resolving a test. 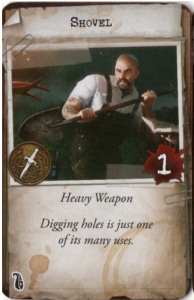 There are 12 insane cards in the core set. Arrrgggh I cannot move. or can I ? 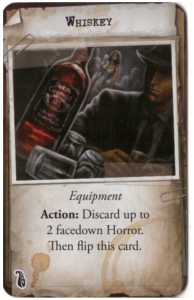 At the end of your turn discard this card. I cannot do anything ! 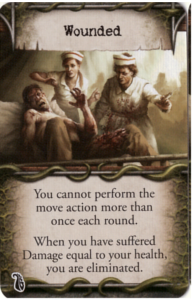 You cannot perfom more than a single action during your turn. 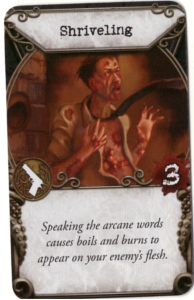 There are 5 Wounded cards in the core set. 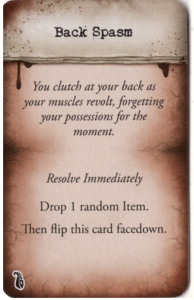 You cannot perform the move action more than once each round. 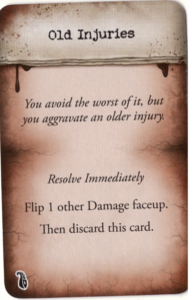 When you have suffered Damage equal to your health you are eliminated. 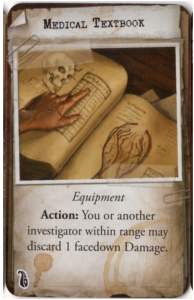 These Cards are spell cards, spell which you will get during a game of Mansion of Madness 2nd edition, or even before a game starts, they have numerous effects on the back side of the cards, when ever you cast them it will have consequences for your investigators. 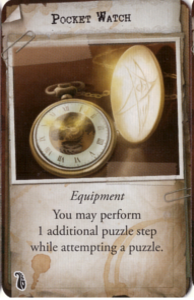 you will find a total of 30 Cards 5 of each spell, in the Mansion of Madness 2nd edition core set. 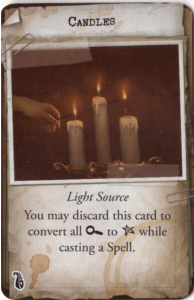 And you will find that spell cards are numbered on the flip side. My mind is hungry it needs to feed. ACTION: You or another investigator within range become Focused. Then flip this card. I need to guard my flesh. 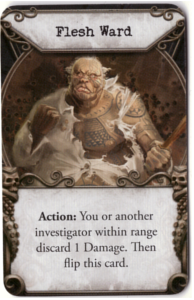 ACTION: You or another investigator within range discard 1 damage. 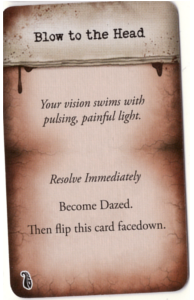 Then flip this card. You should be brave my young soul. 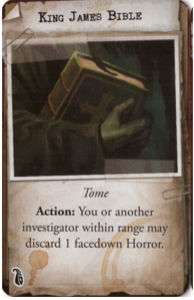 ACTION: You or another investigator within range discard 1 horror. Then flip this card. 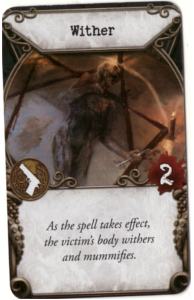 As the spell takes effect, the victim’s body withers and mummifies. we will we will Wrack you. 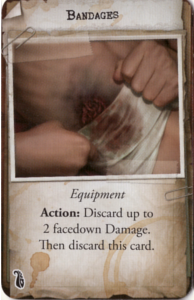 These cards is the Damage of the Mansion of Madness 2nd edition game, when ever you take damage you take a number of cards equal to the Damage dealt to you, with the backside up, a backside that looks like this, if you get a critical hit you will flip the card over and you will get one of the crits below. You clutch at your back as your muscles revolt, forgetting your possessions for the moment. Your vision swims with pulsing, painful light. 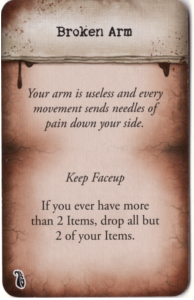 Your arm is useless and every movement sends needles of pain down your side. If you ever have more than 2 items, drop all but 2 of your items. My leg did go ouch. You fall as pain lances up your leg. When you try to stand, you fall all over again. 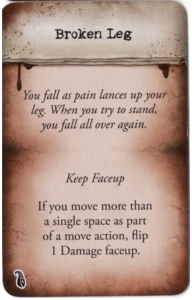 If you move more than a single space as part of a move action, flip 1 Damage faceup. 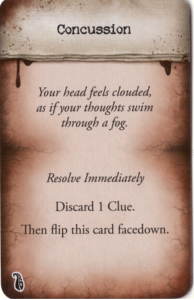 Your head feels clouded, as if your thoughts swim through a fog. 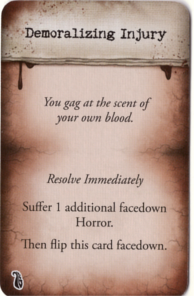 You gag at the scent of your own blood. Suffer 1 additional facedown Horror. You cannot bring yourself to look in a mirror. The look on people’s faces tells you all you need to know. 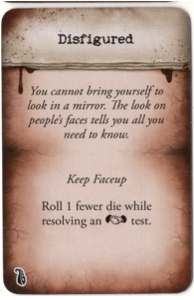 Roll 1 fewer die while resolving an Influence test. Im Hurt Im hurt HELP! The pain clouds your vision and sends you staggering. 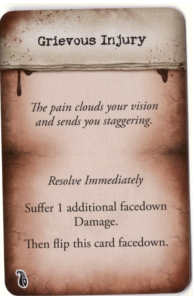 Suffer 1 additional facedown Damage. I can and i will fight through this. The injury is serious, but you will not allow it to slow you down. The stakes are too high for that. Ouch right in my gut.! 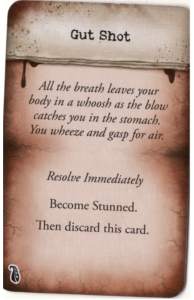 All the breath leaves your body in a whoosh as the blow catches you in the stomach. You weeze and gasp for air. 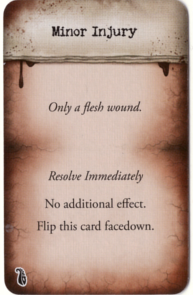 It is only a flesh wound! You thought the wound was much deeper than it is. No effect. Discard this card. Blood oozes from the wound and trickles down your arm, no matter what you do. 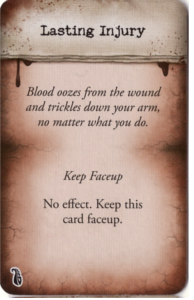 No effect, keep this card faceup. Your vision swims. You worry that you are hurt much worse than it appears. Ouch my muscle is teared apart. 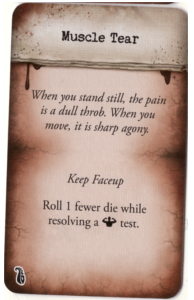 Roll 1 fewer die while resolving a strenght test. I got these old injuries. You avoid the worst of it, but you aggravate an older injury. Flip 1 other Damage faceup. After the splitting pain and partial deafness, you find that your balance is off. Roll 1 fewer die while resolving an agility test. The pain, The pain it stings. You pull your hand back from the pain, shaking and clenching your teeth. You drop whatever you were holding. is my ankle supposed to do that ? 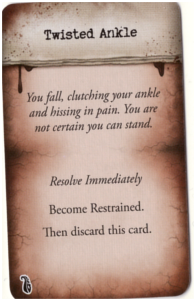 You fall, clutching your ankle and hissing in pain. You are not certain you can stand. 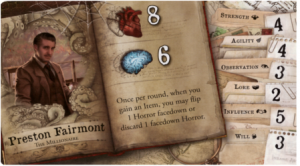 This is the Core sets Horror cards, these are Horror you get if your investigator is experiencing something horrific in the Mansion of Madness 2nd edition game, and you will get to use these I will promise you. 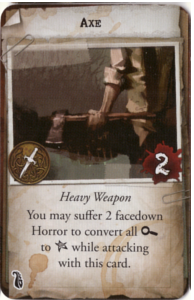 You will find 40 Horror cards in the game and the cards below is the faceup versions you can get in the game. You cannot seem to put the letters or numbers in their proper order. You know you had this skill once, but it has deserted you. 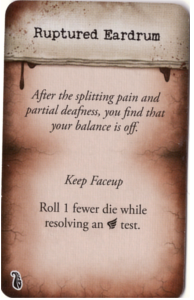 Roll one fewer die while resolving a Lore test. Is it me or are this room VERY small. It is too close in here, too tight. You cannot breathe. You must get to open air. 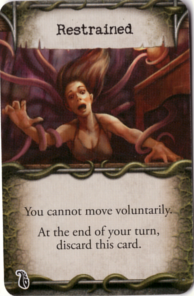 Whenever you end your turn within range of 2 or fewer spaces suffer 1 facedown Horror. Are you afraid are you. You scramble into a corner and hide there, just for a little while. What did you say, i cant remember. 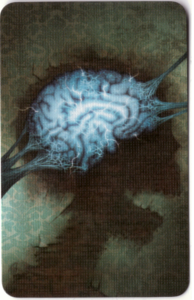 You turn away, already feeling the fog of memory clouding your mind. It is a mercy, truly. Woaa which way are we going. Your wits desert you, leaving you mumbling and uncertain. How could what you have just seen be real? Did i not just see that. Recent memories claw their way to the surface, despite your best efforts. Flip 1 other Horror faceup. Uuhh my nerves is, they really are. You breathe deeply, but it fails to restore your calm. You feel as if the slightest thing will push you over the edge. Roll 1 fewer die while resolving a will test. Did you see that right there. Everywhere you look you see horrible shadows or ghosts from your past. You cannot bear to look any longer. You whimper as your mind rejects the impossible. 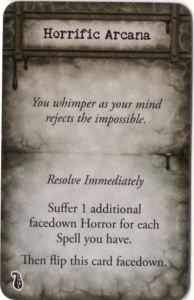 Suffer 1 additional facedown horror for each spell you have. Im Not a crybaby waaaaaaa. You scream, and scream, and scream. 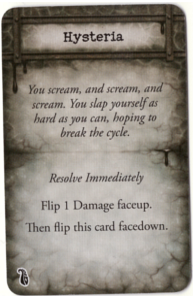 You slap yourself as hard as you can, hoping to break the cycle. I did not steal that, OR that. You do not understand why you need to keep stealing things, but you cannot help yourself. 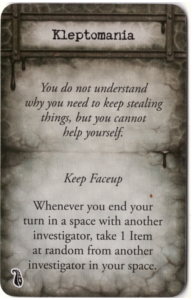 Thenever you end your turn in a space with another investigator, take 1 Item at random from another investigator in your space. You sure its safe in the darkness, there might be monsters. You are not afraid of the darkness, exactly. But you are afraid of what the darkness might be concealing. 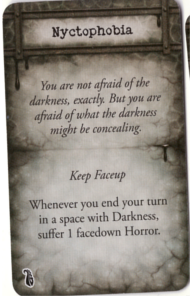 Whenever you end your turn in a space with Darkness, suffer 1 facedown Horror. 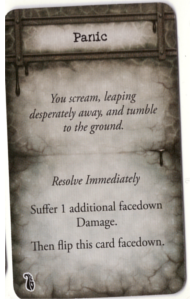 You scream, leaping desperately away, and tumble to the ground. Is somebody following? Somebody IS following. Every noise makes you startle and jump. Even your companions unnerve you. 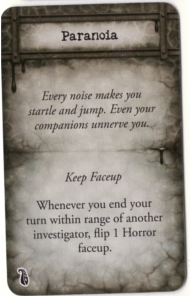 Whenever you end your turn within range of another investigator, flip 1 Horror faceup. Aiiiii arrrgghgh im so sad. You scream and scream and scream, and then you cry and cry, and then giggle, and then hicough. Woooaaa that picture did move. 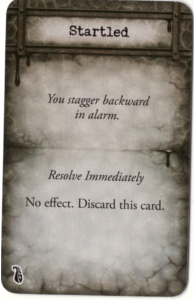 You stagger backward in alarm. I can do this, I can do this. You swallow your fear and take a deep breath. NOW THAT was a suprise. 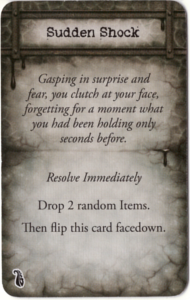 Gasping in surprise and fear, you clutch at your face, forgetting for a moment what you had been holding only seconds before. 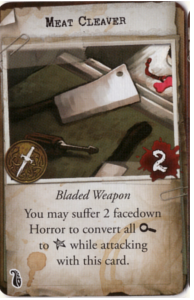 So this was the last entry in this post, i will be posting a list of content in the Mansion of Madness 2nd edition expansion packs aswell in near future. 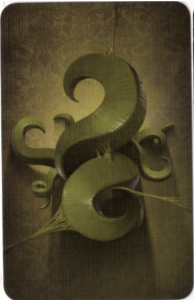 And if you want the card for Beyond the Threshold then you can find them here. 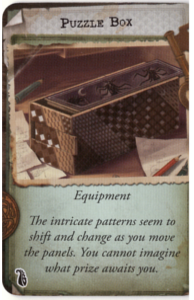 Nice work, I used it to check my cards. 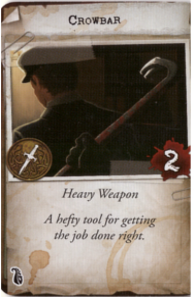 I also found you are missing the Sledgehammer from the common items. Thanks for the nice words. and thanks for letting me know 🙂 i will put it up ASAP. Thanks for the work! Any chance you have the images in a bit better resolution? forget about my previous comment they look great!!!!! Hi! 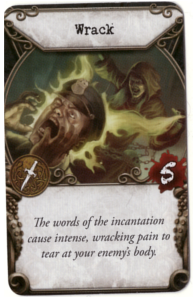 Thanks so much for taking the time to make this page – it saved the game for me and my mates when we couldn’t find the Elder Ward card last Friday. It’s still missing, so I guess I should ask Customer Support to send me a new one. 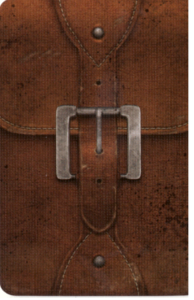 I am trying to make a custom carrying case for a friend, but I need to need the sizes of the additional items in the second edition. I can ask my friend since its a surprise. 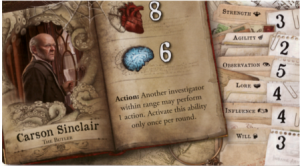 Any chance you can add a good picture with all the additional items with a ruler? I cannot give you a full list of pictures of all items, i can tell how many of each tile there and show one of each Tile size.